The Fly Fishing Show, Infinite Energy Center, Saturday, February 4 (9-5:30). Easy to find us in Booth R9 and at 10:00 a.m., in Room D, Mike will present to the world, our fly fishing vacations in southwest Montana. Check out the new Healing Waters Lodge and Lewis & Clark Expeditions display. Healing Waters Lodge is located in the beautiful Ruby valley in southwest Montana. We have easy access to the Beaverhead, Big Hole, Jefferson, Madison, and Ruby rivers; we also have quick access to miles and miles of private water on spring creeks, streams, rivers, ponds and lakes. Our experienced, knowledgeable and friendly fly fishing guides are second to none. Our Chefs prepare delicious and healthy cuisine; and, our guest rooms are clean and comfortable with two queen beds, private bathroom, wifi, and patios with gorgeous views in all directions. We also have a trout filled casting pond and exercise room. Mike has over 25 years of successfully operating Lewis & Clark Expeditions and is the largest outfitter on the Smith River with over 26 permits. Our Smith River floats are 5-days of float fishing down 60 river miles and four nights of camping with a staff that takes care of everything for you. All you have to do is fish, enjoy yourself, and enjoy the beauty that surrounds you. Mike also has information about our “Fish like a Guide, But, Live Like a Client” fly fishing schools, April 14-19 and again, April 23-28. Ask him about our great package price. 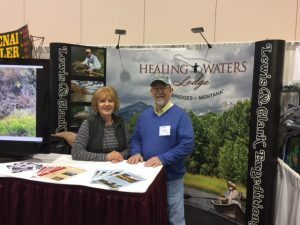 Mike would love to meet you at The Fly Fishing Show, or if you can’t make it there, give him a call at 406-459-2030, anytime!